Neuron-specific PERK inactivation did not alter the viability of neurons or axons under physiological conditions. (A) PCR analysis using genomic DNA shows the floxed Perk allele was present in all tissues in PERK-nKO mice (nKO) and control mice (CTL), but the Perk-KO allele was only present in the cerebral cortex, cerebellum, and spinal cords of PERK-nKO mice. Numbering above lanes is as follows: 1, cerebral cortex; 2, cerebellum; 3, spinal cord; 4, optic nerve; 5, sciatic nerve; 6, spleen; 7, lymph node; 8, T cells. 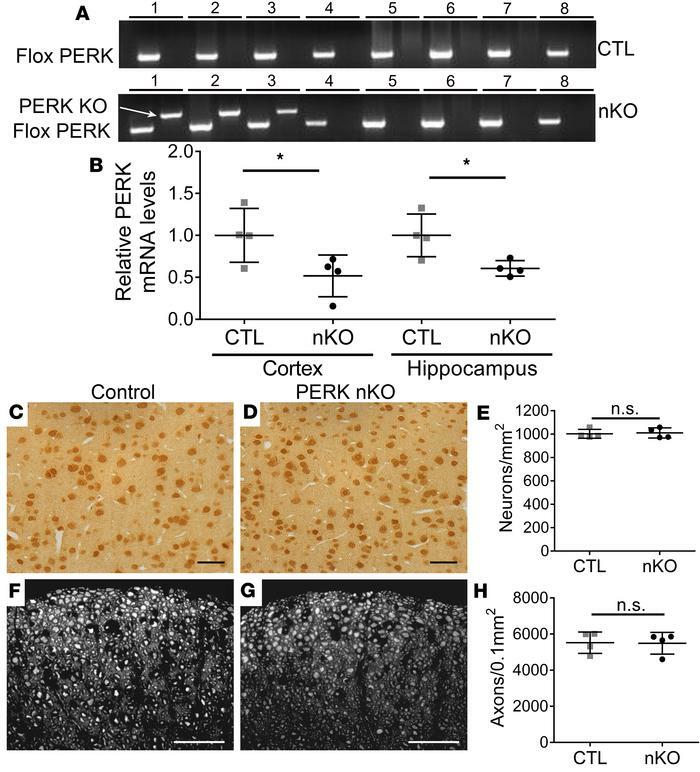 (B) Real-time PCR shows that the level of PERK mRNA was significantly decreased in the cortices and hippocampi of PERK-nKO mice compared with control mice. (C–E) NeuN IHC shows that neuron-specific PERK inactivation did not significantly change the number of neurons in layer V of the primary motor cortices of adult mice. (F–H) SMI31 IHC shows that neuron-specific PERK inactivation did not significantly change the number of axons in the lumbar spinal cords of adult mice. Scale bars: 50 μm. n = 4 animals. Error bars represent SD. Statistical analyses were done with a 2-tailed t test, *P < 0.05.